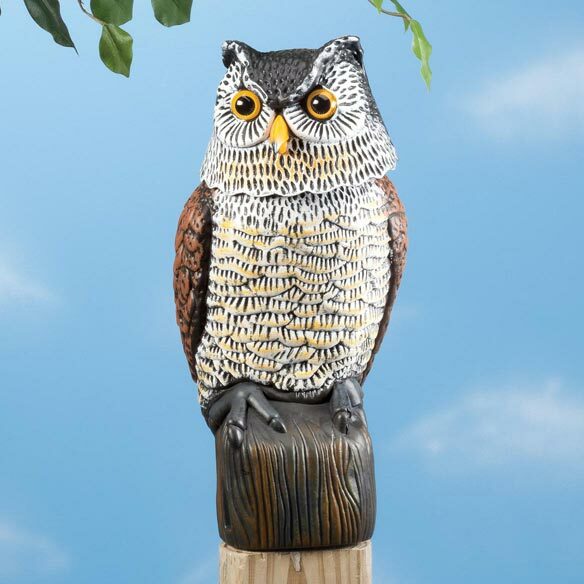 Owl's reflective eyes and realistic appearance gives birds and pests a harmless scare—protecting your garden from unwanted guests. Durable painted finish withstands any weather, while the spring neck adds lifelike shaking and movement in the breeze. Can be set on a post and easily moved. Fill with sand or gravel for added stability. Owl measures 12 5/8" L x 6 3/4" W.
Does it take batteries and make sounds? BEST ANSWER: Thank you for your question. It is not animated meaning it does not move or make sound. We hope this information will be of help to you.